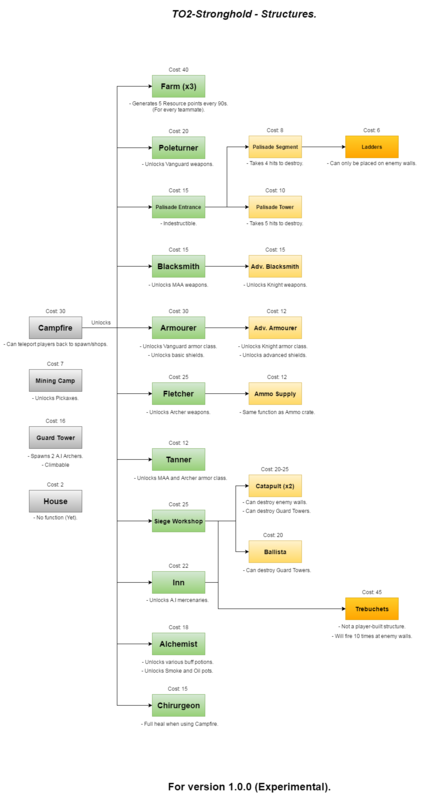 Stronghold is a Team-objective (TO2) map featuring elements from various strategy games. Harvest resources by chopping down trees or mining stone with a pickaxe. Build a village to unlock weapons, armor, siege engines and more! Defend your base by building a palisade and attack with trebuchets and mercenaries! - Form your own strategy and defeat the enemy! Main Objective: Destroy the enemy’s Crystal, while defening your own. It is advised to play the map with enabled Dynamic Lightning (not shadows). Without it, the map will have incorrect lightning, since there are a lot of dynamic actors on the map. How to download the map (for yourself). Subscribe to the map on the workshop page. Select “Click to download subscribed Steam workshop items” in the bottom right corner. You need at least 2 players to start the game, otherwise you won’t be able to leave the spawn. After adding bots you will need to type in console: startgamemanual. Beta v1.0.0 [Initial release, experimental]"
This is awesome. I like this base building approach to gain an advantage in combat. To make it really worth stealing trees from your enemies, you could maybe make them more scarce with more score reward. But it’s confusing that some trees can be chopped down while others can’t. Also, I don’t think all these '‘you gained resource points’ messages are necessary. Maybe just use a private hud message (there is a Kismet node for that). The base/ crystal house is a bit too easily accessible for enemies and it’s maybe too far away from the friendly spawns ergo hard to defend. Maybe a notice, that it is under attack is appropriate (you know, the fancy hud message sliding down on the top of the screen). Also I’d like an option to repair the barricades in front of the entrances. I think the bridge and the river should be important to the gameplay in the sense that you can not cross the river but need to use the bridge. That makes it possible to defend the territory. This allows for upgrades to cross the river one way. You start as a peasant but it’s easy to change the appearance by simply choosing a class. I don’t know if this also changes the abilities. One simple way around this without a mod is to set a Kismet key command consuming the event. In overall, very promising approach. I will check for servers to test the balancing. But it still feels unfinished. I hope you continue the development. Trees that are outside the base(s), cannot be chopped down. I left it like this for the purpose of “natural” cover, but if it causes confusion, I’ll change it. I Might even use buildable siege shields instead. Messages too annoying, gotcha - Already done for the next patch. I like the idea of repairable barricades, consider it done! Mhm, I’d rather leave it as it is. Teams should just focus on building walls as soon as possible, (there is a 3 minute no-rush period). Yeah you can change your appearance, but it doesn’t change your stats. I’ll fix it for the next patch, though. Thanks for taking the time to test the map. It is still in “experimental” phase, so there will be lots of changes! Is it intentional to lose the ability to mine resources after purchasing a weapon? I don’t see a reason for that. @Hordy What do you mean? You can still purchase a weapon and keep a hatchet or pickaxe as a secondary. After playing this a bit online, the best strategy is to run over to hit the enemies crystal. You can do that after or before upgrading your base, it doesn’t seem to matter much. If you have build walls, the enemy just walks through the main gate which is always open. Maybe a destroyable/ repairable gate helps here. Apart from the walls, I didn’t notice many defence upgrades. Maybe some bot guards in the crystal house come in handy which don’t just run after the enemy. @Hordy I’ve changed the Crystal building to only have one, tougher front entrance. A gate for the entrance sounds good, it is in my to-do list. Fix Attempt - Players not spawning as peasants. Fix Attempt - Issues with invisible weapons. Removed side entrances to the “Crystal-House”. Increased Crystal barricade HP from 1000 to 2500. Fixed a bunch of stuck spots. You can now chop trees that are outside the anti-rush barrier. Increased the number of spawn points to 64 total. Lowered Campfire cost from 30 to 20. Lowered Trebuchet cost from 45 to 35. Added few tips that will randomly pop in chat. Added HUD indicators for built shops. Fixed few particle effects not activating. Made the Anti-Rush barrier slightly more visible. Complete rework of Shops. Might even change PurchaseBoxes into normal Triggers (Less buggy). A way to quickly teleport to the crystal room from spawn (For a price, in case of an attack). Less annoying pop-ups about res collection. sometimes you spawn with the enemy and can just run around chopping down fleshy ‘trees’ until they realise, which seemed to take way too long haha. The wall is not just useless but also blocks bots. So an option to open and close the gate is needed. A team member should be able to close and open it from either side of the gate in my opinion. The wall is useless because building a ladder is too easy. I don’t think you can even destroy ladders. Ladders also make trebuchet upgrade useless. Archer upgrade is nice but they are quickly killed. Also defending the crystal is too difficult. Once the message pops up in the chat that it is attacked, it’s already too late. Once you arrived there, the crystal is already half destroyed. So the matches end rather quickly. The guards are nice though. Sure. I’ll add a lever for the gates. You can destroy ladders with 3 hits. I might make the ladders much more expensive to balance things out. Well archers are meant to be squishy, also remember it is the ONLY class that can buy ranged weapons. To help defend crystals i’ll make a statue/shrine in the base that will teleport players instantly to the crystal room (for a price). I also still want to make repairable barricades. Fixed few minor shop bugs. I actually meant the archer tower upgrade, spawning 2 bots with fire arrows. They are a too easy target for just being spawned once but they are quite effective. 8 respoints for a ladder is kinda cheap, even if quickly destroyable. Good to know though. Beta v1.2 is up for testing! Assigned proper phys-assets to PurchaseBoxes. Completely Re-done kismet resposible for assigning classes and player status. Forced garbage collection after few minutes (Experimental). Forcing proper player models by Overriding pawn assets (Not just customize pawn), [Might mess up player skins]. Now players will be only able to spawn after initial countdown. Building ‘purchaseboxes’ will now get destroyed upon building a structure. Shops now use ChangePlayerWeapons instead of ChangePawnLoadout. Increased barricade HP from 2500 to 3250. Increased Ladder cost from 8 to 15. Note: I don’t really know what causes that glitch where players can’t do anything/spawn with invisible weapons - Hopefully this version fixes it, if not i’ll just keep digging… I think it is because of the high playercount, maybe the server can’t keep up…? I assume it’s because the server needs to know about your exact rotation which needs to be sent first. The box requires precise aiming after all. It’s also worth checking if the box is not partially occluded by other collision bounds. Beta v1.3 is up for testing! More spawn changes - Making sure players leave the spawn with right class and weapon. Added levers for the gates. (With 10s cooldown). Added a warning when trying to change class. Removed Multi-Mesh Matinee animations for many structures. (Except walls, towers and mining camps). Buildings will now instantly pop up when built. Changed now immovable dynamic actors to AOCStaticMeshes. Players that get stuck while a structure is being built, will get teleported to the campfire. I’ve done so much optimizing for this map in the last few days… Hopefully “the glitch” is gone, so I can focus on adding more features.